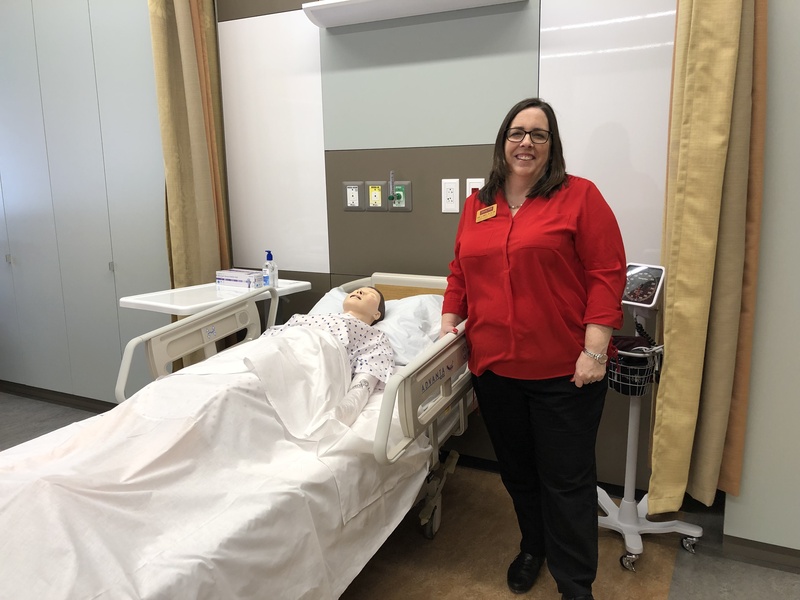 Diane Kondas, director of the nursing program at Seton Hill University, poses for a photo in the new nursing lab on the first floor of Maura Hall. SHU launched its nursing major program in December after receiving approval from the Pennsylvania State Board of Nursing and will begin classes in the fall. Photo by P.Parise/Setonian. Seton Hill University continued expanding its natural and health sciences department with the addition of its four-year bachelor of science in nursing degree in December. The university is currently accepting applications for students who wish to enroll in the nursing program, and the first classes will begin this fall. “The school is already very rich in the sciences and health sciences, so adding nursing was just kind of a natural move because it just further expands on the expertise the university has,” said Diane Kondas, director of the nursing program at SHU. After discovering that SHU wanted to add a nursing program, Kondas said she wanted to become involved because of her interest in “helping nursing education in Westmoreland County.” Kondas, who has years of experience in nursing education and clinical settings, began working at SHU last April. She spent last summer creating the university’s application for the Pennsylvania State Board of Nursing, and the board’s approval in December gave SHU the green light to start admitting students. In addition to expanding the sciences, Kondas said SHU wanted to help improve the nursing shortage. According to SHU’s official website, more than 500,000 nurses are expected to retire by 2022. SHU is the latest local higher education institution to offer a nursing program. The University of Pittsburgh at Greensburg recently launched its nursing program, Westmoreland County Community College offers an associate degree in nursing and Saint Vincent College will begin its nursing program through Carlow University in the fall. The university has been preparing for the new program by designating two classrooms on the first floor of Maura Hall solely for nursing. While one room more closely resembles a typical classroom, the other will serve as a nursing lab. 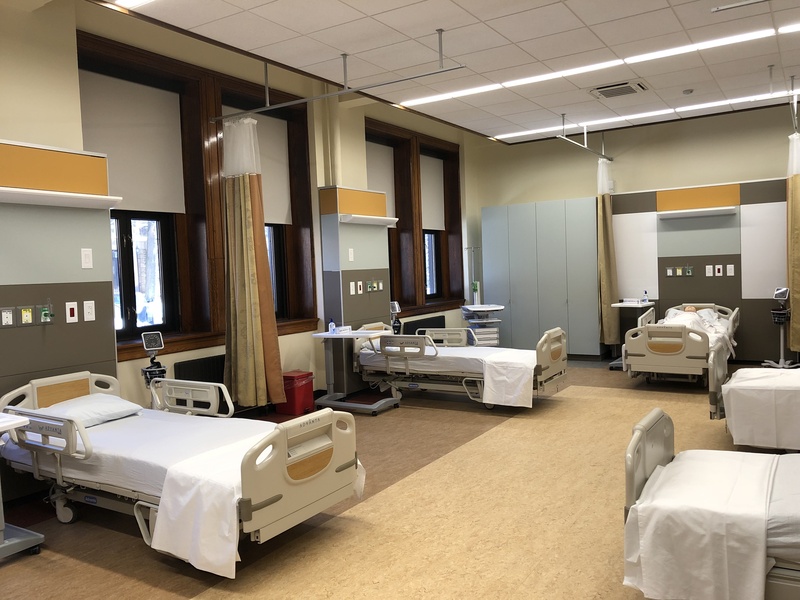 The lab passed its inspection and is equipped with five hospital bed stations and a mannequin for students to practice hands-on skills in class. Kondas is currently the only professor who will teach nursing courses, but plans to hire additional faculty during the 2019-2020 academic year. Nursing-specific courses were created to teach students topics including physical assessment, clinical skills, adult health and family nursing. Pictured above is Seton Hill University’s nursing lab, which is located on the first floor of Maura Hall. The nursing lab is equipped with five hospital bed stations, where students can practice hands-on nursing skills. The nursing major program at SHU will begin its first classes in the fall after reaching approval from the Pennsylvania State Board of Nursing in December. Photo by P.Parise/Setonian. “We definitely had to create a whole new curriculum for the nursing students, but in addition, we’re trying to capitalize on the strengths of the university so the sciences are instilled from the school of natural and health sciences,” Kondas said. Along with their courses, students will also gain experience by working in hospital facilities. SHU’s partnerships include UPMC (Children’s Hospital of Pittsburgh, UPMC East, UPMC McKeesport), Excela Health Network (Westmoreland, Latrobe and Frick hospitals), Allegheny Health Network (Forbes and Jefferson hospitals), Uniontown Hospital, Loyalhanna Care Center, William Penn Care Center and Caritas Christi. SHU’s nursing program is being launched through the Daniel J. Wukich School of Nursing, which was made possible by a donation from Daniel J. Wukich. Wukich is a SHU trustee and the founder, owner, president and CEO of Quest Healthcare Development, Inc. Kondas said donations and grants have helped provide funding to start the nursing program. The nursing program joins multiple other programs in the sciences that SHU offers, including physician assistant, health sciences, nutrition and dietetics, exercise science and orthodontics. SHU also has partnerships with the Lake Erie College of Osteopathic Medicine (LECOM) and Salus University. Kondas said SHU’s expectation is to admit 24 students to the nursing program for the fall 2019 semester. She is also planning to seek accreditation for the nursing program from the Commission on Collegiate Nursing Education in the future.